Dir: Don Amis, 1974, 16mm transferred to digital video, 9 min. Dir: Charles and Altina Carey, 1968, 16mm, 58 min. Don Amis moved to Los Angeles in 1968, with the specific intention to work with Operation Bootstrap, a social program operating from an unused warehouse at the corner of 42nd Street and Central Avenue in South East Los Angeles. Founded two months after the Watts Rebellion, Bootstrap was initiated by Lou Smith and Robert Hall, two previously active members of the Congress of Racial Equality (CORE) who became disillusioned with the organization’s lack of presence in and direct support for the black communities of Los Angeles. In the neighborhood of Avalon, where Bootstrap was located, 35% of families were living below the poverty line established by the Social Security Administration. Rebooting the Watts slogan “burn, baby, burn” as the motto “learn, baby, learn,” Bootstrap centered on the provision of communication and job training programs by volunteer teachers, and quickly gained a level of momentum with support from both liberal and conservative ends of the political spectrum. It also became an established space for debate between radical black activists and white liberals that pushed beyond civil rights based notions of equality, into the confrontation of structural racism. Amis’s UCLA “Project One” film Ujamii Uhuru Schule [Community Freedom School] is a portrait of an Afrocentric primary school in South Los Angeles. In the face of persistent segregation and discriminatory school conditions, the Freedom School movement emerged around the U.S. in the early 1960s with curricula that focused on the social, political, and economic context of existing race relations and the Civil Rights Movement, alongside traditional classes. 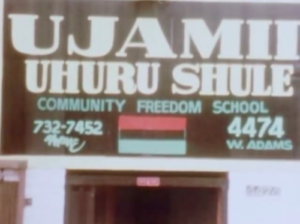 In Amis’s depiction of Ujamii Uhuru Schule (Swahili for Community Freedom School) the school’s teaching of the importance of cultural values and self-defense, under the banner of the Pan-African flag, highlights a shift in the early ’70s toward the cultural and political autonomy sought through the black power movement.